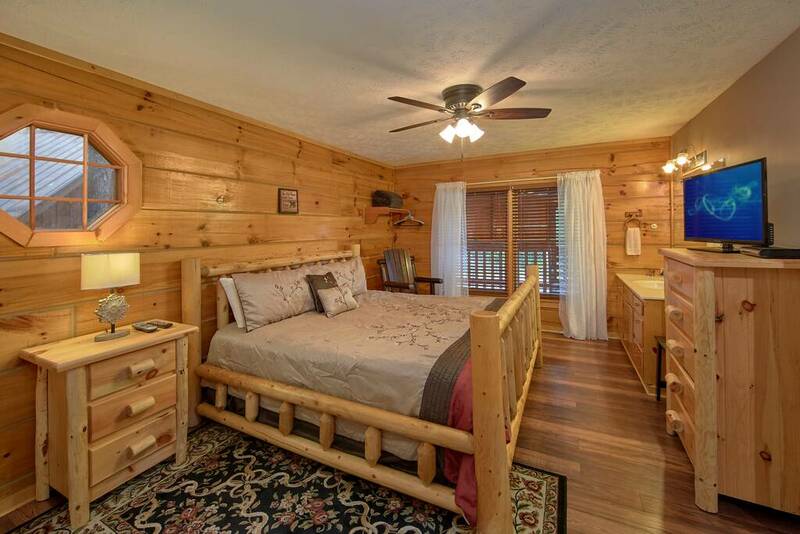 One of the most beautiful two-bedroom log cabins in the Smokies is Bear’s Creek, charmingly situated over a small creek with warm reddish-brown wood and a striking green roof. 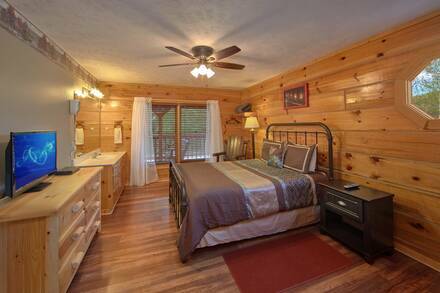 It is a great spot for a family vacation or a couples’ getaway, with plenty of luxuries as well as all-modern fixtures. 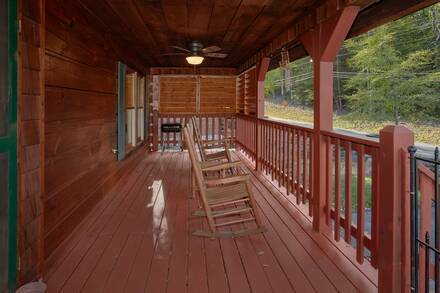 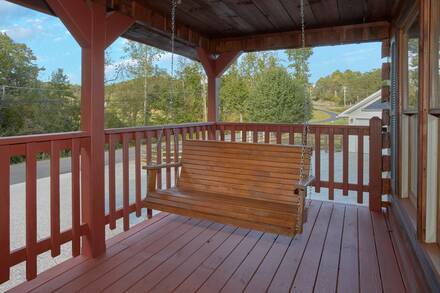 Wooden steps lead you onto the covered front porch, which has a porch swing from which to listen to the sounds of nature. Once inside, the high ceiling and open floor plan make this cozy cabin seem bright and airy. Just inside is the fireplace, mounted in floor-to-ceiling stone, with a large flat-screen television mounted beside it. 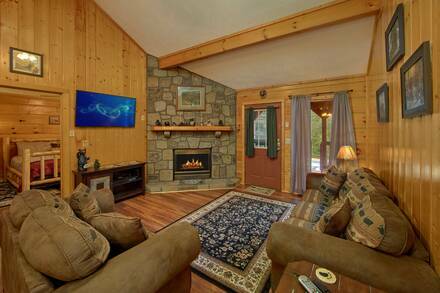 Enjoy the fire or your favorite flick from the comfy couches and enjoy the understated mountain decorations. 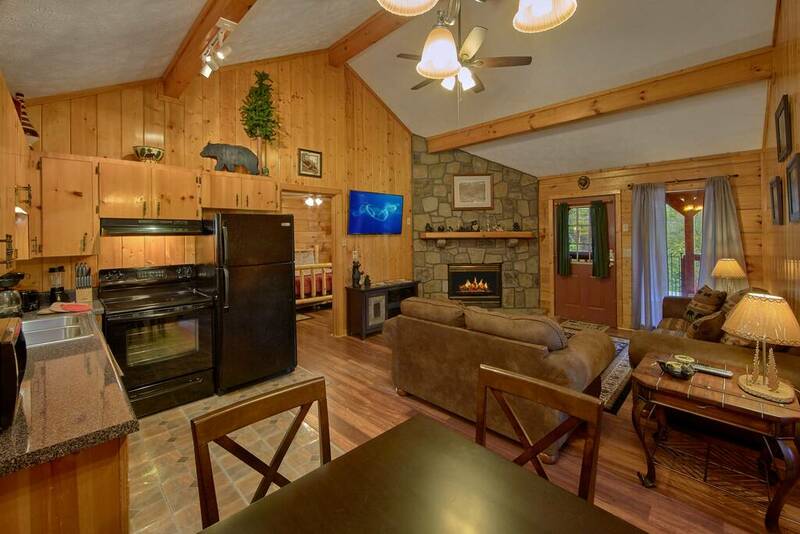 There is a full kitchen and a dining room table, which make it easy to save money on dining by packing a picnic or using the charcoal grill to make a memorable dinner. The master suite features log furniture and a king bed, with its own television and a beautiful octagonal window. 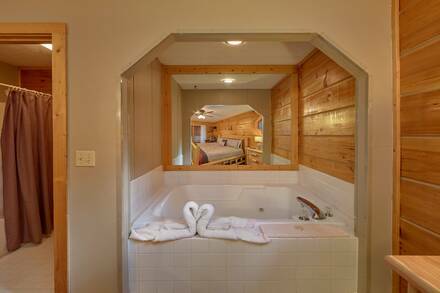 Its full bathroom has a special jacuzzi room with a mirror on one side that makes the space seem much bigger. The second bedroom features a queen bed and full bathroom. 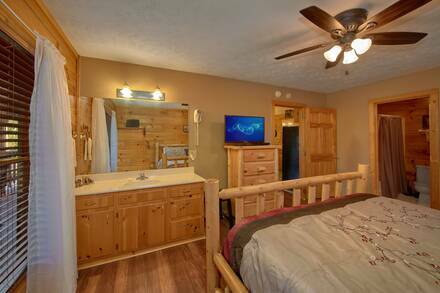 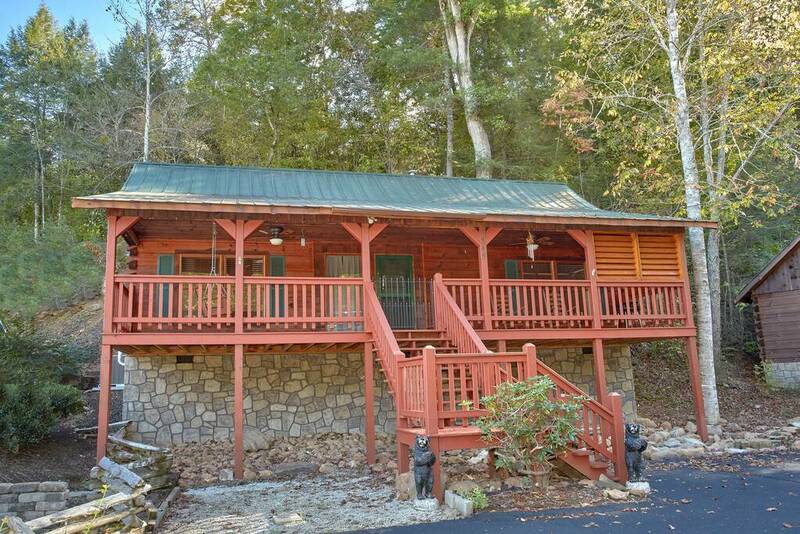 Bear’s Creek is only 2.5 miles from the Parkway in Pigeon Forge, with its amusement parks and easy access to shopping in Gatlinburg and hiking in the Smokies. 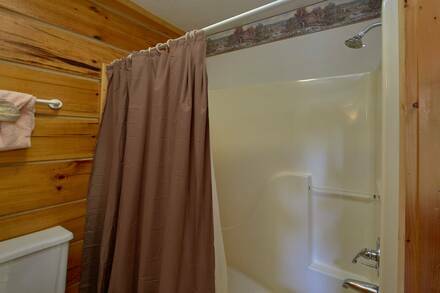 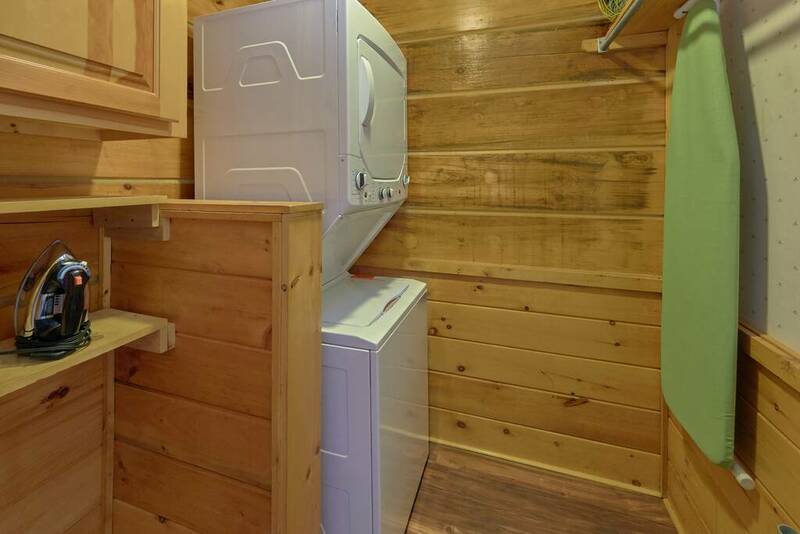 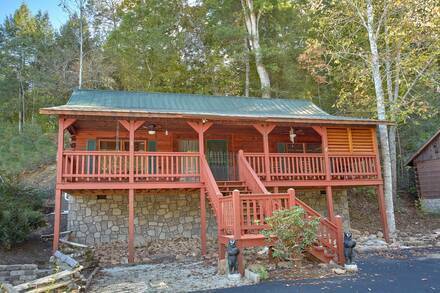 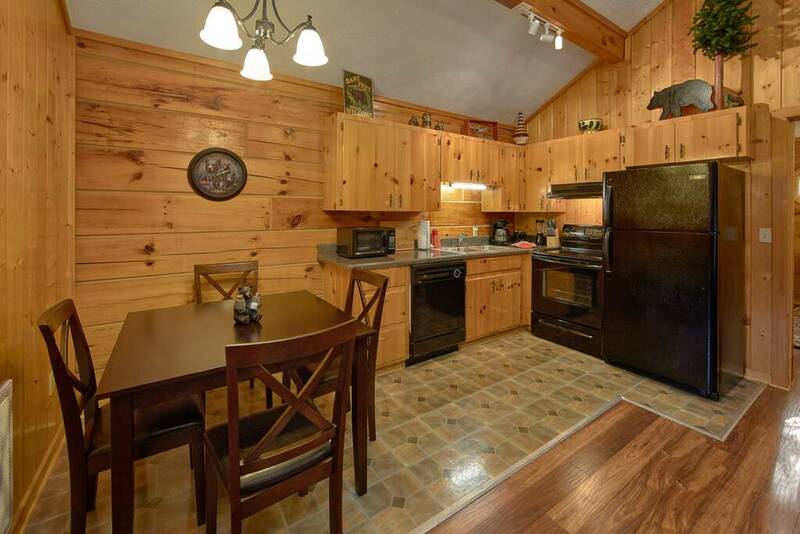 It also comes with access to the nearby resort pool and is also one of our pet-friendly cabins. 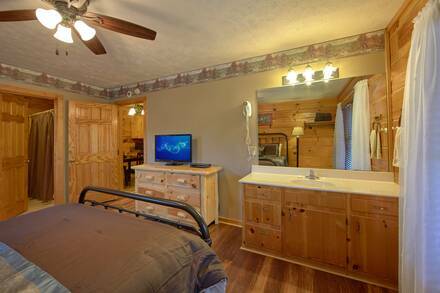 Book some special time with loved ones and pets now!